Convert calories into exercise time with our mobile app! MAKE SMARTER CHOICES WHEN YOU DINE OUT! 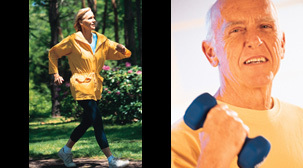 Unfortunately, neither dieting nor exercising is very effective for promoting weight loss. The best strategy is to PREVENT weight gain before it occurs. Several research studies have shown that, when calorie information is presented as "exercise equivalents," people do make smarter choices. Links to those studies can be found HERE. 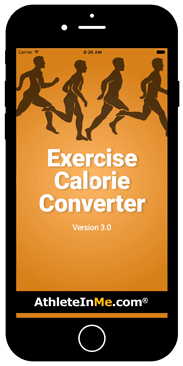 Our innovative and award-winning Exercise Calorie Converter app does that! It converts the calories in franchise restaurant menu items into minutes of exercise (walking, jogging, biking, swimming). It's easy: Enter your weight, then select items from our unique database that contains over 6000 menu items from more than 50 franchise restaurants, including more than 400 beers! If a specific item isn't listed, simply enter its calorie amount and run the calculation. Finally, a tool that will really help you maintain a desirable weight! COMPATIBILITY: Available for both Apple iOS and Google Play. (If the App Store and/or Google Play buttons do not appear below, refresh this page, disable ad-blocking, or use another browser.) NOTE: In September 2017, Apple released iOS-11. This new OS will not support apps developed in 32-bit format. If you are still using Version 2.0 of our app (released in 2013), you will need to upgrade to Version 3.3 (64-bit format).